Imagine if you will the US Navy at the height of the Reagan Administration. The US Navy rules the world’s oceans with 600 ships-of-war. There are no serious challengers either in numbers or expertise. Now further imagine another nation that shares the same language, same culture and similar values challenging the supremacy of the US Navy by declaring war. This nation has 14 ships of war. This nation’s pip squeak navy bests the US Navy in six consecutive ship-to-ship encounters. It changes nothing world-wide except to get the US Navy to stop fighting one-to-one engagements with the pip queak navy and at the same time swells the pip squeak navy with confidence and begins a tradition that would last the next 200 years. It’s an imperfect analogy but it gives the general idea of what the US Navy faced at the beginning of the War of 1812-a war with Great Britain that few really wanted. 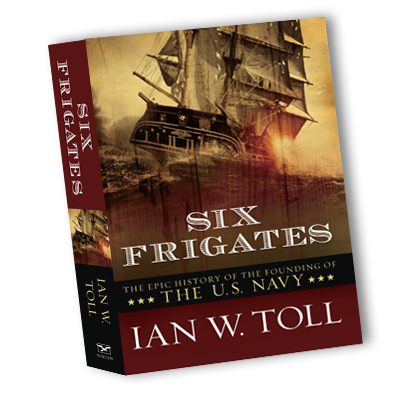 Six Frigates is a book by Ian W. Toll. It documents the start of the US Navy in the 1790’s through the War of 1812 with Britain. The incentive to have a navy at all came from trouble with the Barbary Pirates, four Muslim, nominally Ottoman, North African countries that made their way by pirating merchant ships, mostly from second-rate naval powers that could do little about it. Prior to the Revolutionary War American merchant ships had little to fear from the Barbary Pirates because American ships were British ships and protected by the Royal Navy who had undisputed naval supremacy just about everywhere. This obviously changed after the Revolutionary War when the British adopted the common sense attitude that since the US was now an independent nation they should either pay off the Barbary Pirates or protect their shipping with a navy of their own. Neither option was too attractive to the Americans. The US did not like the idea of paying protection money especially when the four nations that promoted piracy kept changing the rules. But the US really didn’t want to build a navy either for the simple reason that navies were and are expensive. The US had a significant war debt following the Revolution and many thought it irresponsible to spend tax money on a navy when there was a such a debt. The argument is not dissimilar to what’s going on now in the US except it’s the not the navy that is the issue. It’s run-away government spending while carrying a 15 trillion-dollar debt. But I digress. And so Congress dithers about for a number of years trying to solve the problem of the Barbary Pirates. Finally, an ocean-going fleet of six frigates is authorized to be used more or less as a police force against the pesky pirates. Toll does a superb job of detailing the process and the politics that were involved and the book is filled with interesting tidbits that I found fascinating. 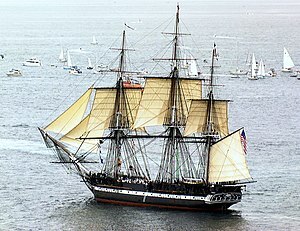 For example, most Americans at least from my generation know that the USS Constitution, one of the six frigates was called “Old Ironsides” because the ship’s hull was made of oak and during an engagement with a British frigate cannon balls seemed to bounce off the Constitution’s oak hull. A sailor remarked that the Constitution was made of iron and the nickname stuck. What was interesting to learn is that the oak that was used in the construction of the Constitution, the President and the United States (three of the six frigates) was a type of live oak found only on some swampy island off the coast of Georgia! The expedition to harvest the oak and get it back to the ship builders in New England is a story in and of itself. Another interesting side story had to do with the design of the frigates. The same three frigates mentioned above were super frigates. They were bigger than a British frigate and more heavily armed and the live oak used made them harder to sink from hull shots. Another great sub-story was the controversy that surrounded the decision to build those three frigates with the larger dimensions and heavier broadsides. The British who had naval warfare down to a science believed that had the perfect balance between ship size, armament, masts and whatever else factored into building an efficient frigate. They made the argument as did many experienced American sea captains that building American frigates with larger dimensions and heavier guns would upset the apple cart of common knowledge and be a maritime disaster. Oddly, the main designer of the super-frigates had never been to sea but somehow his design and specifications were adopted despite the fact that almost everyone “in the know” hated the idea. Toll’s book is full of interesting details like that. I learned much about early American politics (yikes, you think it’s contentious now), the construction of sailing ships from a by gone age, what it would take to make a six-month cruise, what it was like to captain a frigate, dueling and what a ship-to-ship combat looked like in the early 1800’s (often bloody but usually fought with a code-of-honor sort of like a knightly joust but with heavy cannon broadsides). In other words it would be wrong to assume that Six Frigates majors in the ship-to-ship encounters with the Royal Navy. To be sure these engagements are covered and covered well, but it’s the other details that make the book a magnificent read if a person has any interest at all in the age of sail and the early history of the American Navy. I rate the book with 5 stars. I was there, in the Navy, during the Reagan era! Wonderful, amazing years. Been meaning to read this book. I’ll have to pick up a copy. I think you’ll enjoy it. I got a copy at the library and liked it so much got a used copy off Amazon!